ONE clear morning in May, Nick Thorpe left his Edinburgh flat, ducked off the commuter route and hitched a ride aboard a little white canal boat, heading west towards the sea. It was the first mutinous step in a delightful boat-hopping odyssey that would take him 2500 miles through Scotland’s canals, lochs and coastal waters, from the industrial Clyde to the scattered islands of Viking Shetland. With no transport of his own, the optimistic writer relied on an eccentric cast of sailors, visionaries and nautical nomads, boarding anything from a fishing trawler to a rowing tub to a yellow submarine. Writing with characteristic humour and candour, the award-winning author of Eight Men and a Duck plots a curiously existential voyage, inspired by those who have left the warm hearth for the promise of a stretched horizon. 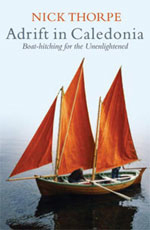 Whether rowing a coracle with a chapter of monks, scanning for the elusive Nessie, on the rocks with Captain Calamity or clinging to the rigging of a tall ship, Thorpe weaves a narrative that is by turns funny and poignant – a nautical pilgrimage for any who’ve ever been tempted to try a new path just to see where it might take them. Part travelogue, part memoir, Adrift in Caledonia is a unique and affectionate portrait of a sea-fringed nation – and of the drifter’s quest to belong.